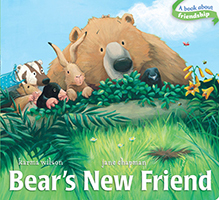 Jane Chapman is the illustrator of over one hundred books for children, including Dilly Duckling by Claire Freedman and I Love My Mama by Peter Kavanagh, as well as Karma Wilson’s Bear Snores On, Bear Wants More, Bear Stays Up for Christmas, and Mortimer’s Christmas Manger. She lives with her family in Dorset, England. The sun is setting and it's getting chilly. When Bear's friends discover that he is not at home in his lair, they march out into the cold to find their pal. Friends don’t let friends stay lost! Wren, Owl, and Raven take to the skies while Badger, Mole, and Mouse search on the ground. 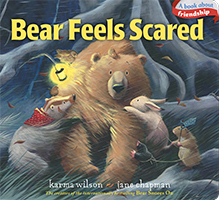 Pretty soon Bear is found, and once he's back in his cave, he feels quite safe with his friends all around.